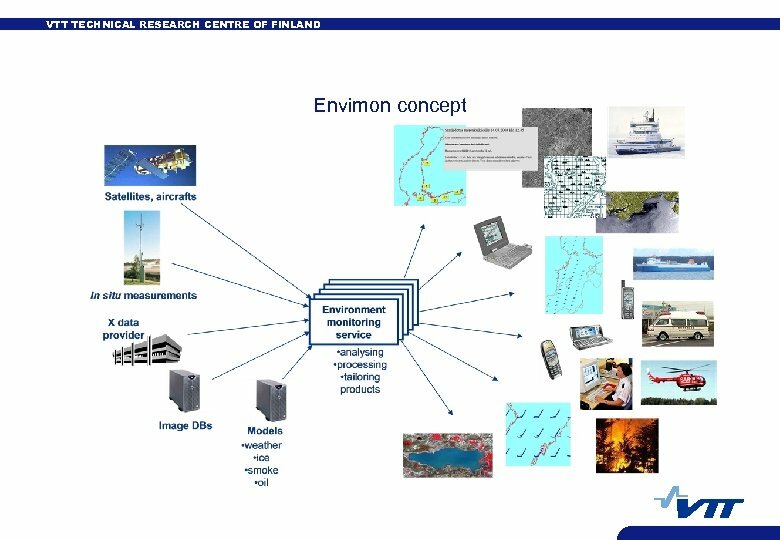 VTT TECHNICAL RESEARCH CENTRE OF FINLAND Mission and objective • Mission • The mission of the project is to make the environmental monitoring that the participating organizations practice in their operation more efficient. -> More accurate environmental information, less expensive approaches etc. 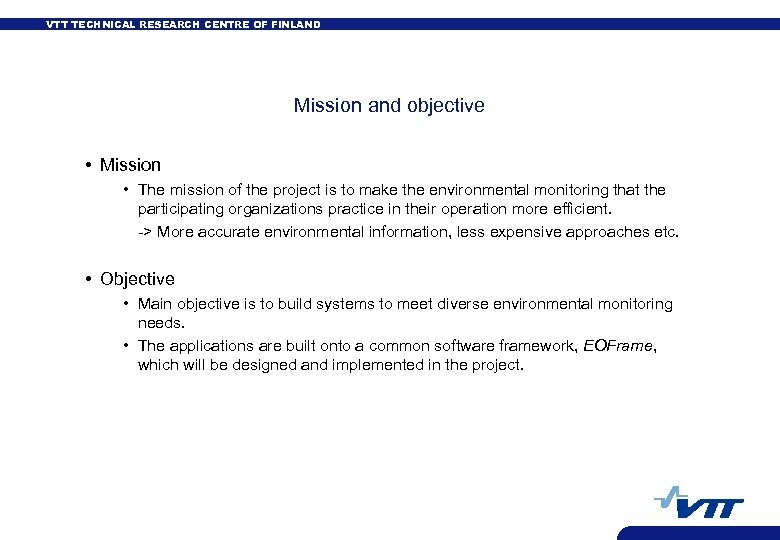 • Objective • Main objective is to build systems to meet diverse environmental monitoring needs. 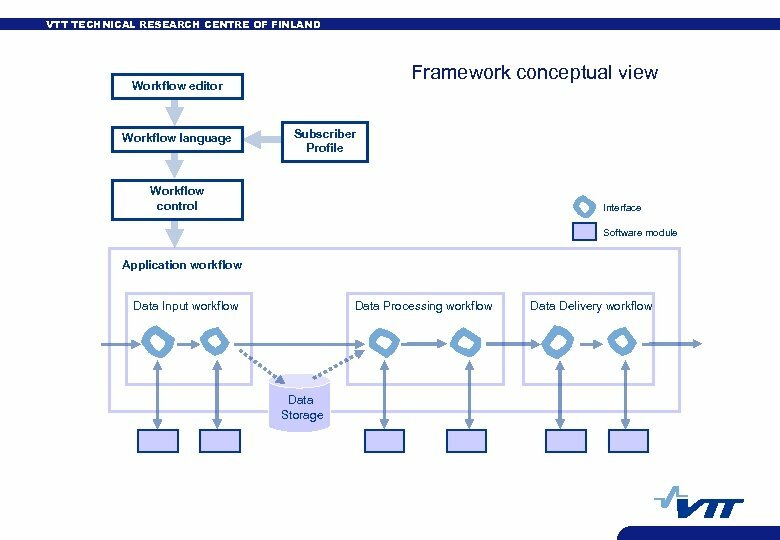 • The applications are built onto a common software framework, EOFrame, which will be designed and implemented in the project. 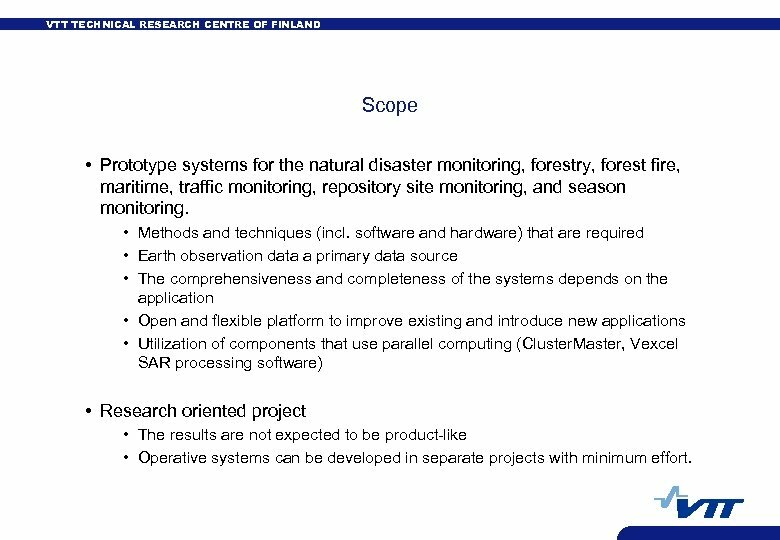 VTT TECHNICAL RESEARCH CENTRE OF FINLAND Scope • Prototype systems for the natural disaster monitoring, forestry, forest fire, maritime, traffic monitoring, repository site monitoring, and season monitoring. • Methods and techniques (incl. 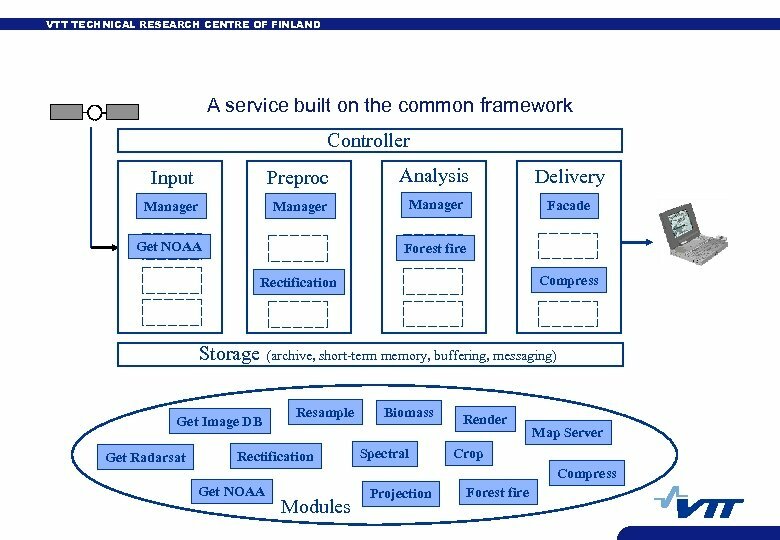 software and hardware) that are required • Earth observation data a primary data source • The comprehensiveness and completeness of the systems depends on the application • Open and flexible platform to improve existing and introduce new applications • Utilization of components that use parallel computing (Cluster. 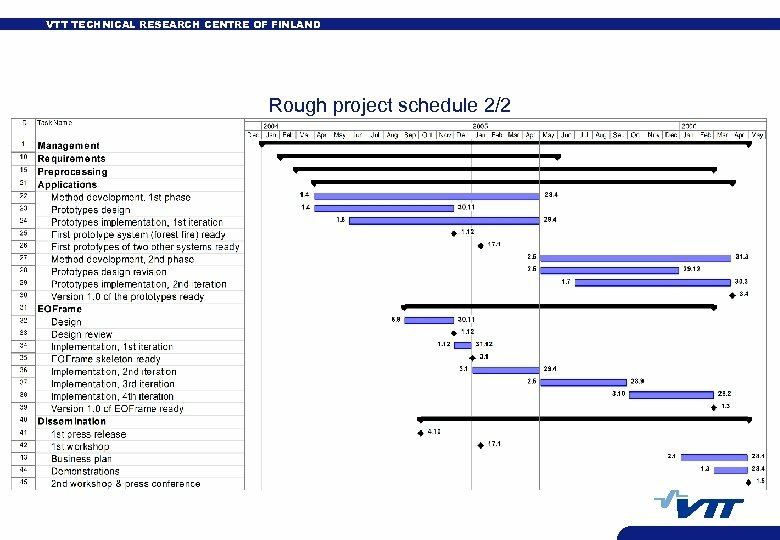 Master, Vexcel SAR processing software) • Research oriented project • The results are not expected to be product-like • Operative systems can be developed in separate projects with minimum effort. 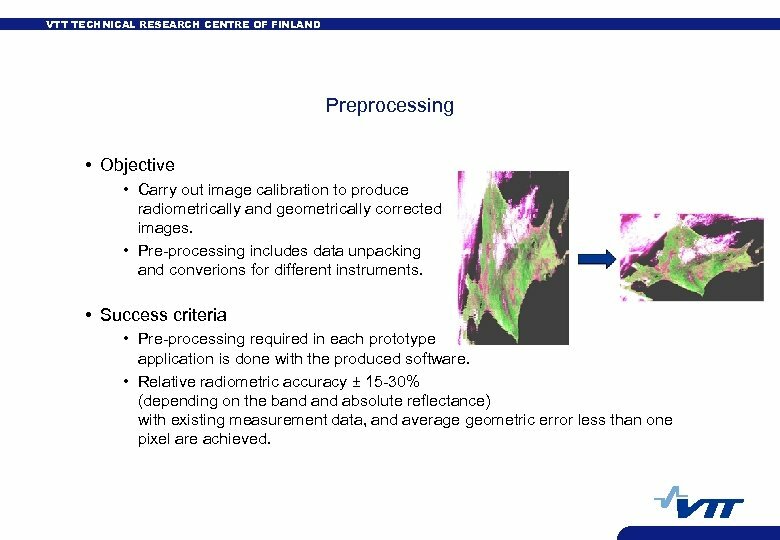 VTT TECHNICAL RESEARCH CENTRE OF FINLAND Preprocessing • Objective • Carry out image calibration to produce radiometrically and geometrically corrected images. 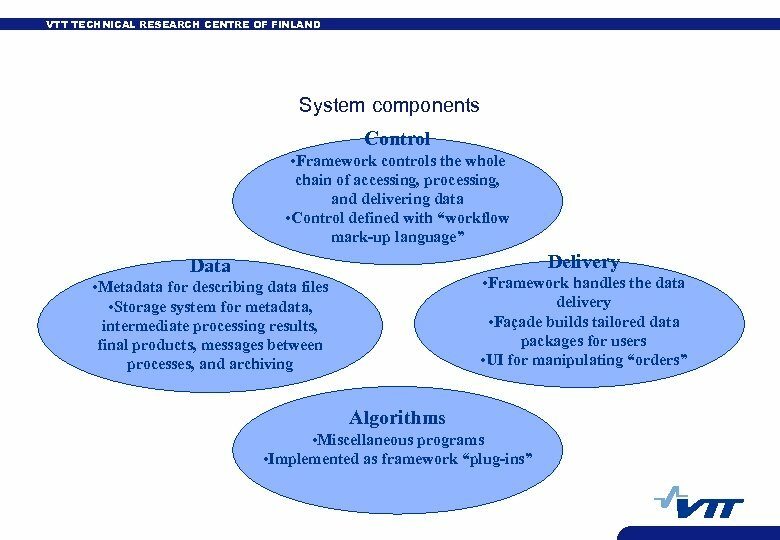 • Pre-processing includes data unpacking and converions for different instruments. • Success criteria • Pre-processing required in each prototype application is done with the produced software. • Relative radiometric accuracy ± 15 -30% (depending on the band absolute reflectance) with existing measurement data, and average geometric error less than one pixel are achieved. 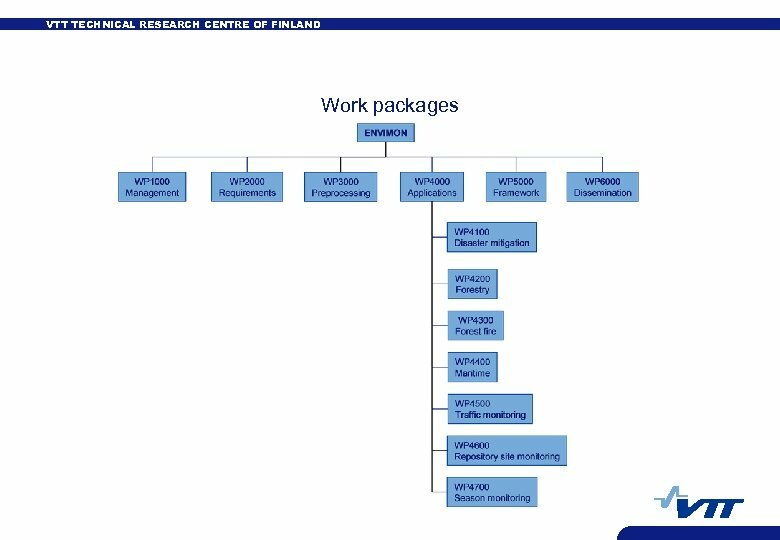 VTT TECHNICAL RESEARCH CENTRE OF FINLAND Disaster monitoring • Objective • To develop analysis methods and procedure to provide timely information of the disaster at different phases, mitigation, warning, response, and recovery. 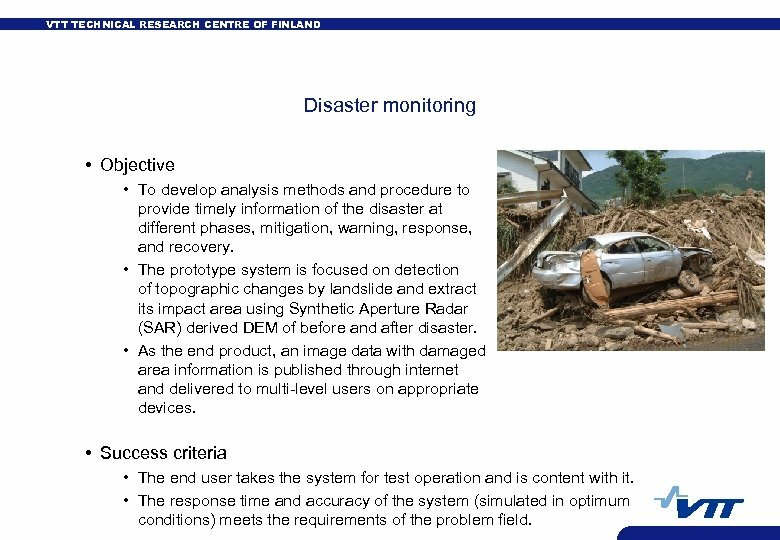 • The prototype system is focused on detection of topographic changes by landslide and extract its impact area using Synthetic Aperture Radar (SAR) derived DEM of before and after disaster. • As the end product, an image data with damaged area information is published through internet and delivered to multi-level users on appropriate devices. • Success criteria • The end user takes the system for test operation and is content with it. • The response time and accuracy of the system (simulated in optimum conditions) meets the requirements of the problem field. VTT TECHNICAL RESEARCH CENTRE OF FINLAND Forestry • Objective • To develop methods and software for producing forest resource maps of various regions in the world • To develop and implement the spectral bank concept • Success criteria • A system that utilizes the spectral banks in e. g. forest variable estimation is implemented and working. 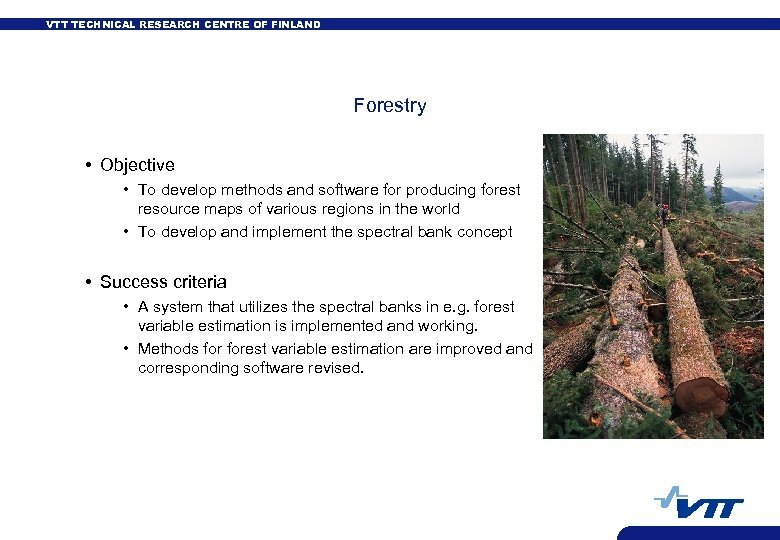 • Methods forest variable estimation are improved and corresponding software revised. 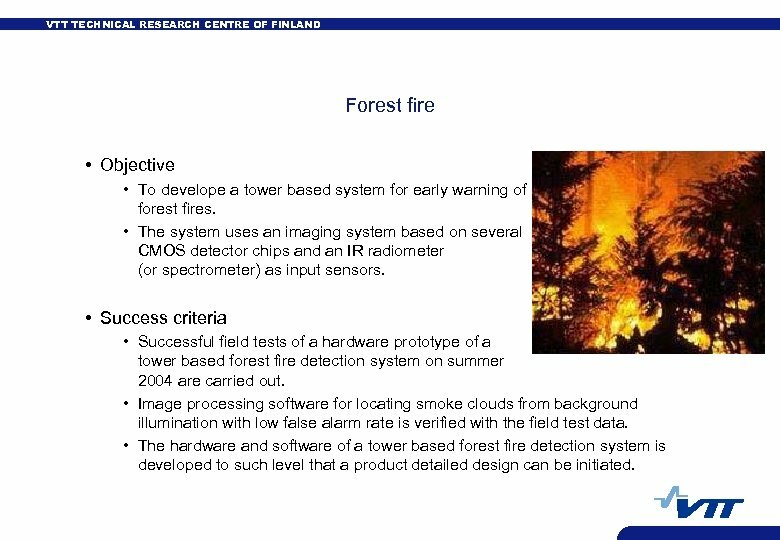 VTT TECHNICAL RESEARCH CENTRE OF FINLAND Forest fire • Objective • To develope a tower based system for early warning of forest fires. • The system uses an imaging system based on several CMOS detector chips and an IR radiometer (or spectrometer) as input sensors. • Success criteria • Successful field tests of a hardware prototype of a tower based forest fire detection system on summer 2004 are carried out. • Image processing software for locating smoke clouds from background illumination with low false alarm rate is verified with the field test data. • The hardware and software of a tower based forest fire detection system is developed to such level that a product detailed design can be initiated. 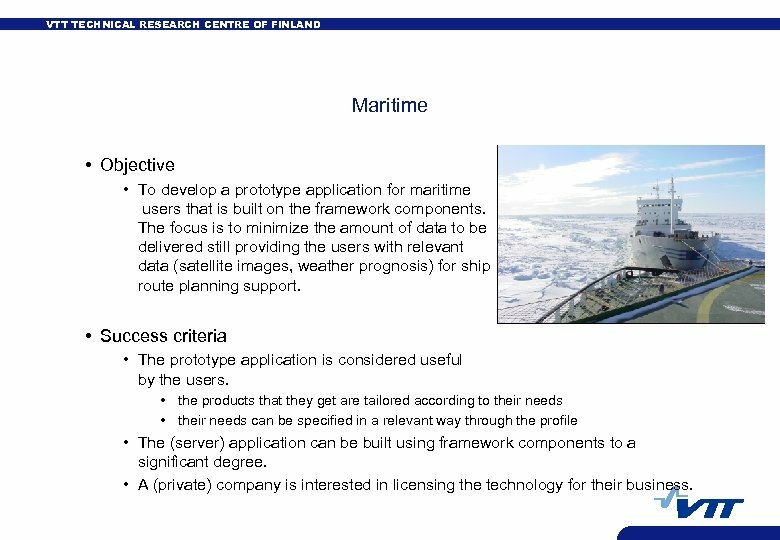 VTT TECHNICAL RESEARCH CENTRE OF FINLAND Maritime • Objective • To develop a prototype application for maritime users that is built on the framework components. The focus is to minimize the amount of data to be delivered still providing the users with relevant data (satellite images, weather prognosis) for ship route planning support. • Success criteria • The prototype application is considered useful by the users. • the products that they get are tailored according to their needs • their needs can be specified in a relevant way through the profile • The (server) application can be built using framework components to a significant degree. • A (private) company is interested in licensing the technology for their business. 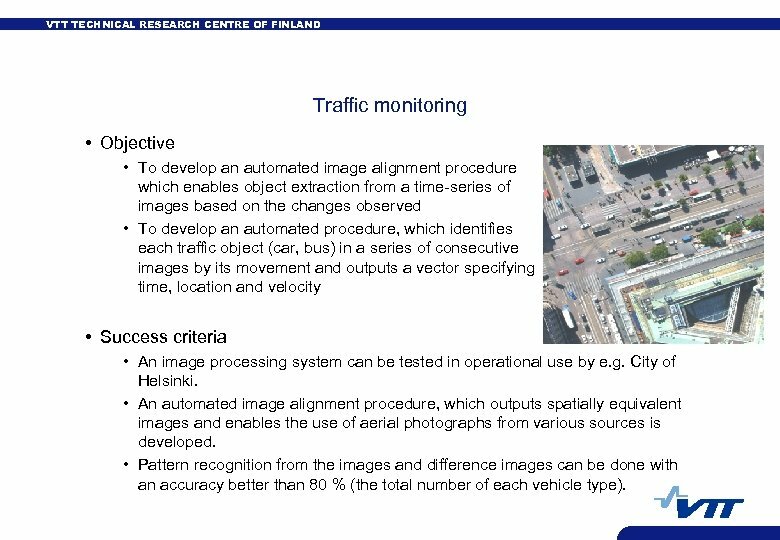 VTT TECHNICAL RESEARCH CENTRE OF FINLAND Traffic monitoring • Objective • To develop an automated image alignment procedure which enables object extraction from a time-series of images based on the changes observed • To develop an automated procedure, which identifies each traffic object (car, bus) in a series of consecutive images by its movement and outputs a vector specifying time, location and velocity • Success criteria • An image processing system can be tested in operational use by e. g. City of Helsinki. • An automated image alignment procedure, which outputs spatially equivalent images and enables the use of aerial photographs from various sources is developed. • Pattern recognition from the images and difference images can be done with an accuracy better than 80 % (the total number of each vehicle type). 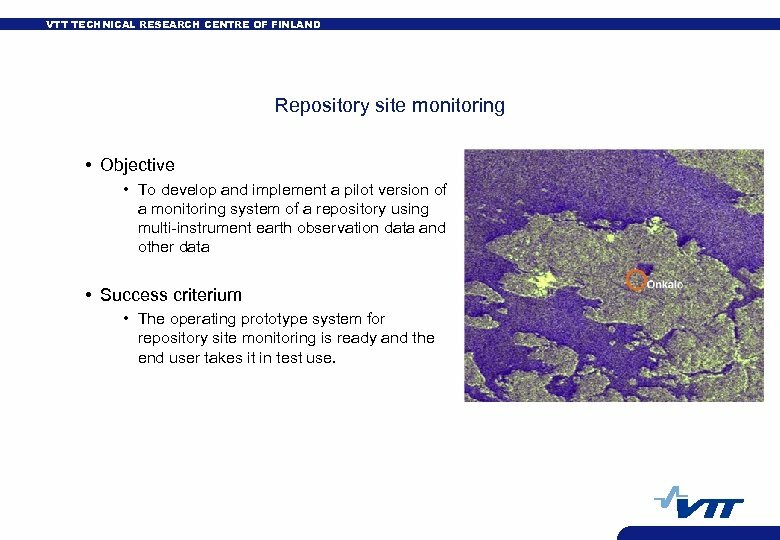 VTT TECHNICAL RESEARCH CENTRE OF FINLAND Repository site monitoring • Objective • To develop and implement a pilot version of a monitoring system of a repository using multi-instrument earth observation data and other data • Success criterium • The operating prototype system for repository site monitoring is ready and the end user takes it in test use. 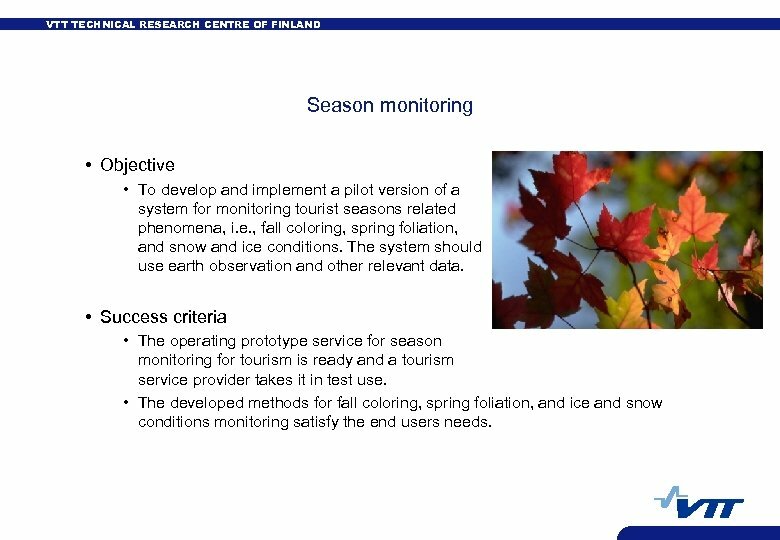 VTT TECHNICAL RESEARCH CENTRE OF FINLAND Season monitoring • Objective • To develop and implement a pilot version of a system for monitoring tourist seasons related phenomena, i. e. , fall coloring, spring foliation, and snow and ice conditions. 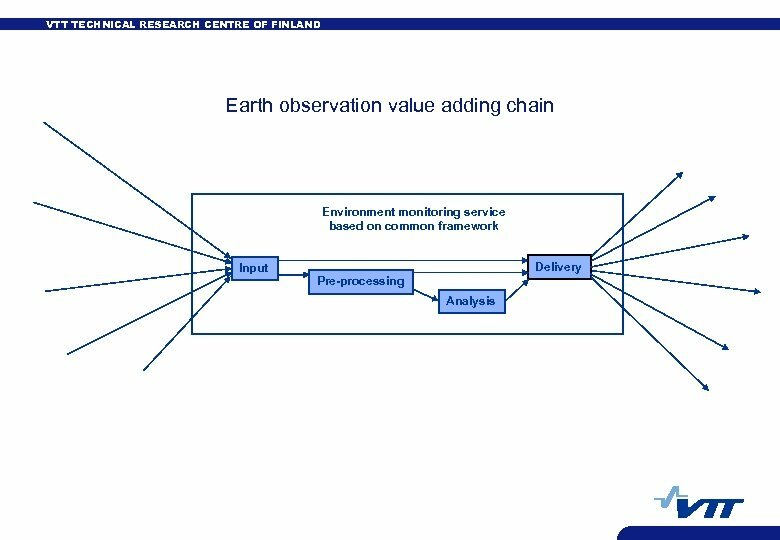 The system should use earth observation and other relevant data. • Success criteria • The operating prototype service for season monitoring for tourism is ready and a tourism service provider takes it in test use. • The developed methods for fall coloring, spring foliation, and ice and snow conditions monitoring satisfy the end users needs. 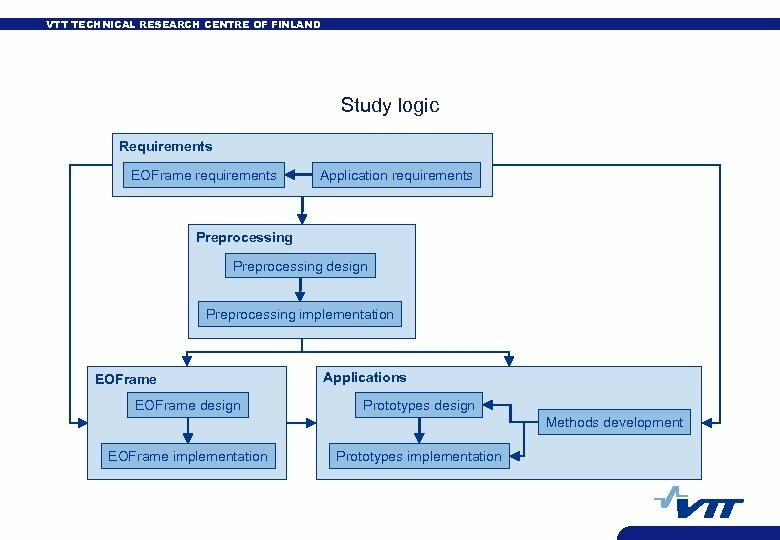 VTT TECHNICAL RESEARCH CENTRE OF FINLAND Common software framework • Objective • Implement a software framework (EOFrame) for building autonomous EO data processing and delivery services. 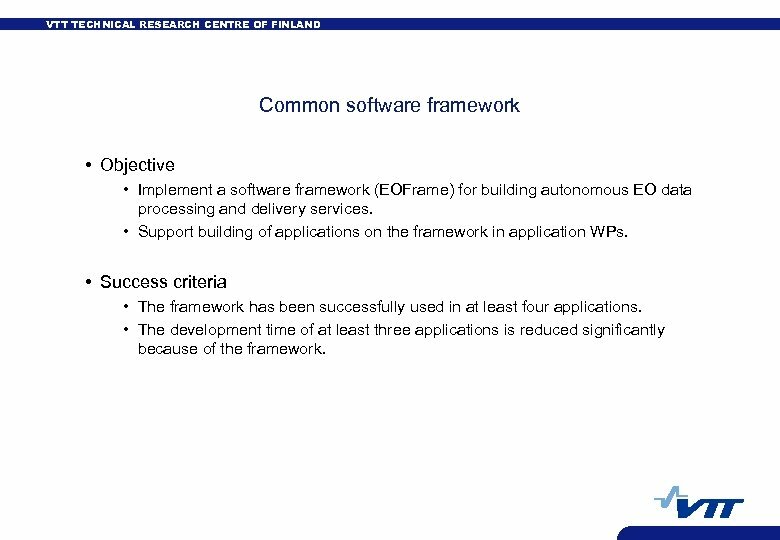 • Support building of applications on the framework in application WPs. • Success criteria • The framework has been successfully used in at least four applications. • The development time of at least three applications is reduced significantly because of the framework. 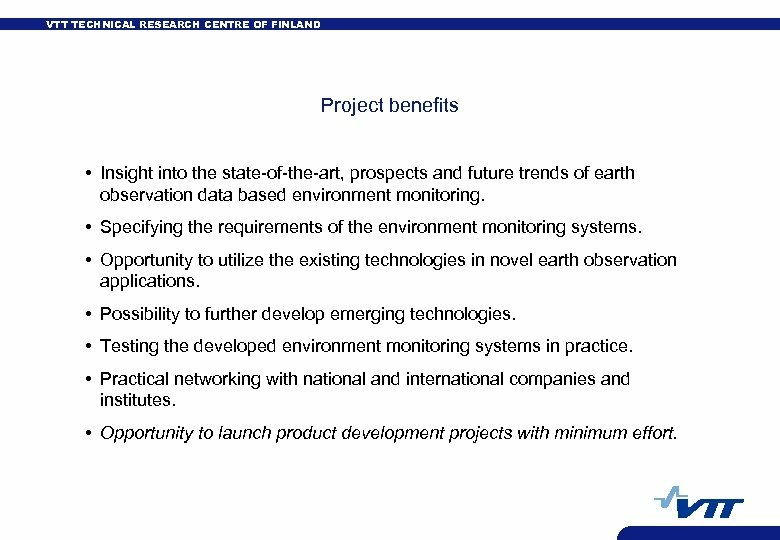 VTT TECHNICAL RESEARCH CENTRE OF FINLAND Project benefits • Insight into the state-of-the-art, prospects and future trends of earth observation data based environment monitoring. 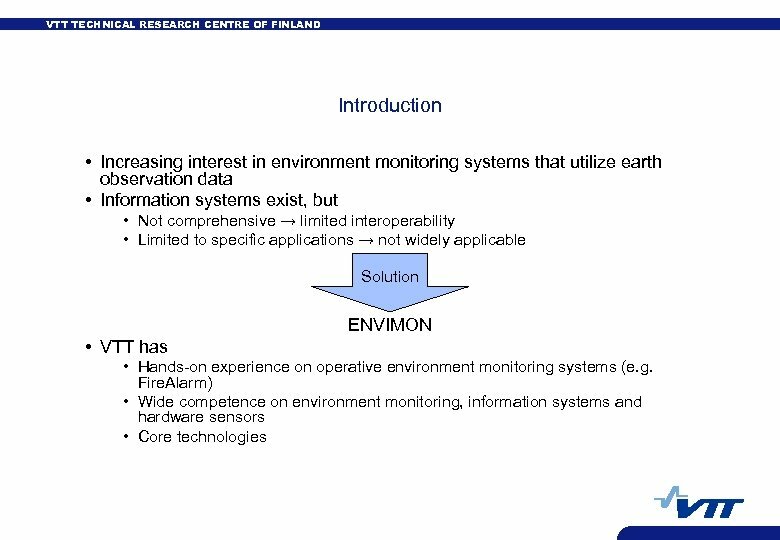 • Specifying the requirements of the environment monitoring systems. 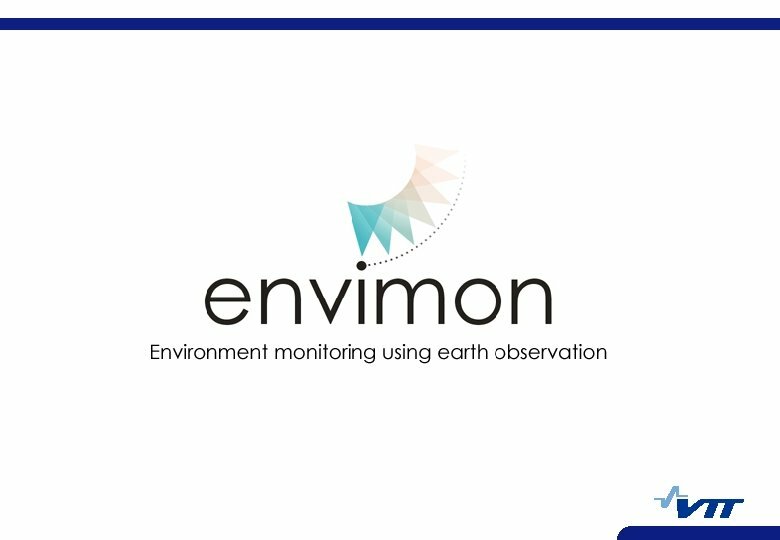 • Opportunity to utilize the existing technologies in novel earth observation applications. • Possibility to further develop emerging technologies. 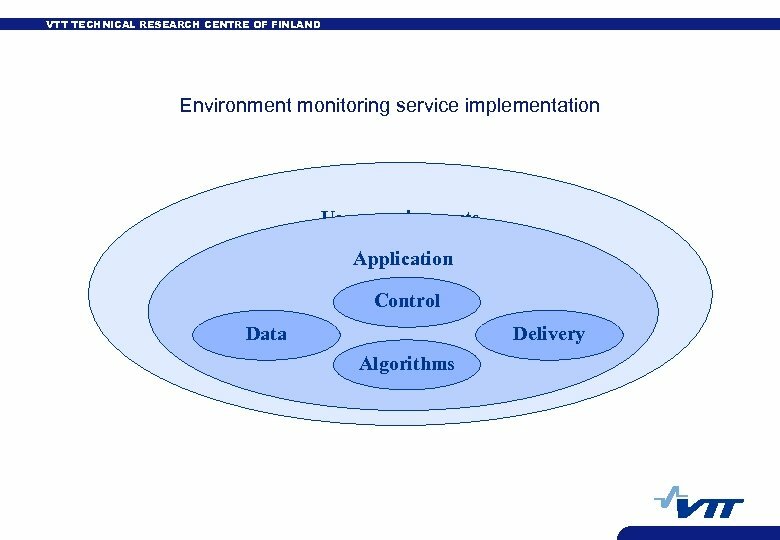 • Testing the developed environment monitoring systems in practice. • Practical networking with national and international companies and institutes. • Opportunity to launch product development projects with minimum effort. 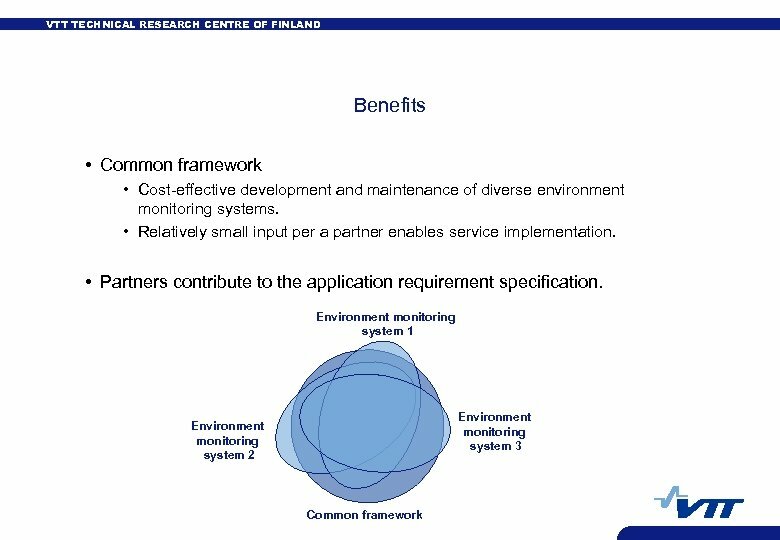 VTT TECHNICAL RESEARCH CENTRE OF FINLAND Business potential • Cost-effective operation by using comprehensive environment monitoring systems (end users). 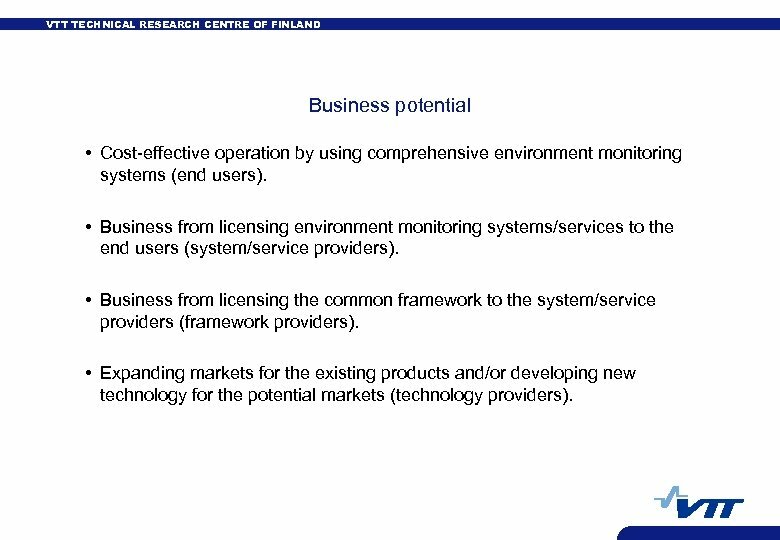 • Business from licensing environment monitoring systems/services to the end users (system/service providers). • Business from licensing the common framework to the system/service providers (framework providers). • Expanding markets for the existing products and/or developing new technology for the potential markets (technology providers). 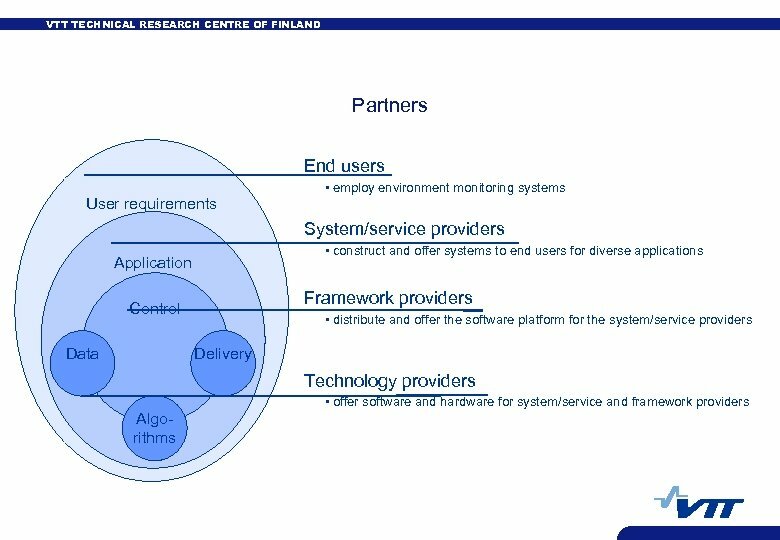 VTT TECHNICAL RESEARCH CENTRE OF FINLAND Utilization concept • The future product development has two principal alternative paths • Product and general service facility development for a system provision company and • Specific service development for an end user or for a consultant. 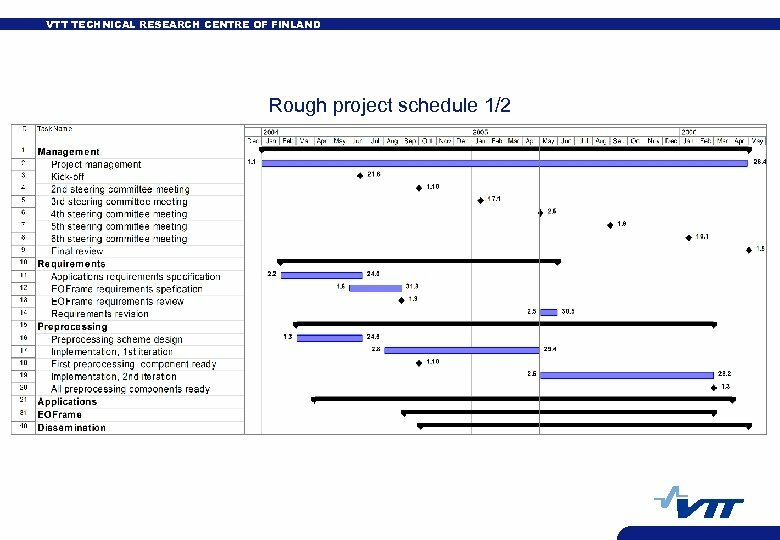 VTT TECHNICAL RESEARCH CENTRE OF FINLAND Project details • The overall budget 1200 k€ for two years. • TEKES funding 60%. • Company/institute funding more than 10%. 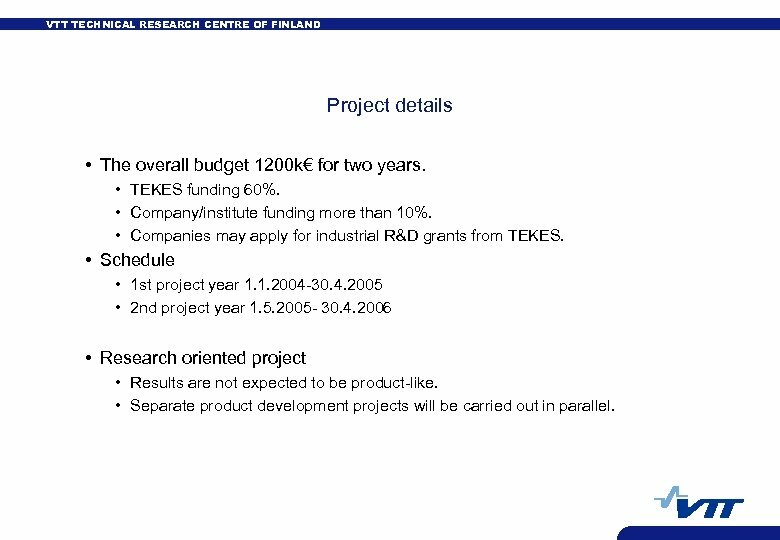 • Companies may apply for industrial R&D grants from TEKES. • Schedule • 1 st project year 1. 1. 2004 -30. 4. 2005 • 2 nd project year 1. 5. 2005 - 30. 4. 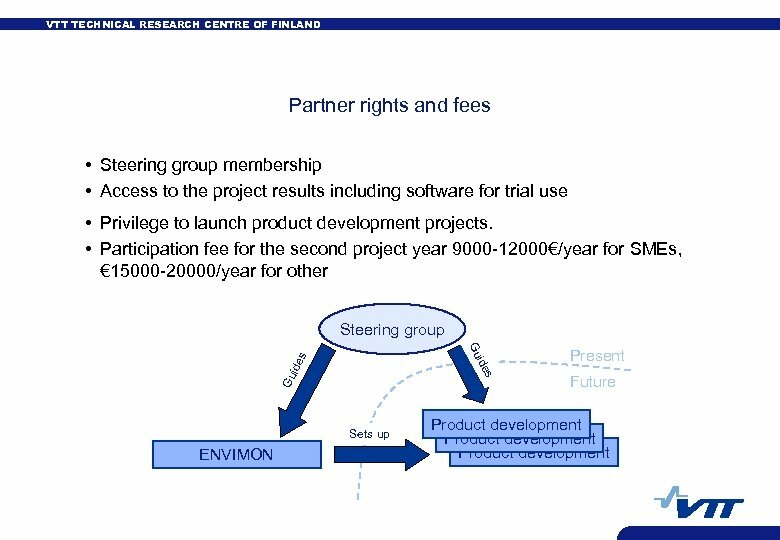 2006 • Research oriented project • Results are not expected to be product-like. • Separate product development projects will be carried out in parallel.